3 years ago Robert Field was doing everything that society had told him would bring him happiness. He had earned a masters degree that enabled him to get a great job in finance making plenty of money and everything on paper was just fine when all of the sudden he had a really tragic 4 days. He was fired from the fishing rod startup where he was working in finance, he ended a serious relationship with his girlfriend which left him with nowhere to live and his uncle walked to a city park and committed suicide by shooting himself in the head. These experiences catapulted him into following his passion with a vengeance and that passion is kayak fishing and making YouTube videos about his adventures. His pursuit of following his dream and being a YouTube Star along the way had begun. Now 3 years later, Robert is a marketing influencer and Youtube star with nearly 100,000 subscribers to his YakFishTV channel, 37,000 followers on Instagram at YakFishTV and the big one SPONSORSHIPS! 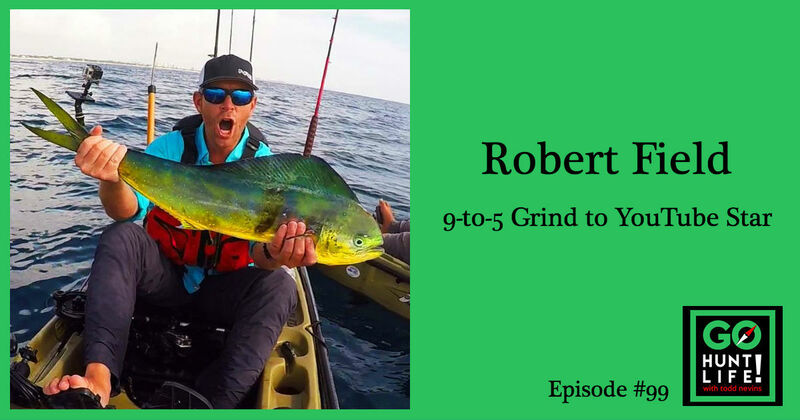 But Robert doesn’t consider himself a Professional Angler or a You Tube Star, he considers his real profession to be a Professional Videographer. We go through his evolution into his new profession and that moment during his journey when he absolutely knew that he was on the right path. That moment was brought to him by a 10 year old girl and an emotional call from her mom. Thank you to previous guest Mark Vlaskamp for introducing me to Robert. Mark also has a story from corporate grind to kayak fishing. You can check it out on episode #79, 15,482 Mile Road Trip Through 37 States With 1 Canoe and Endless Possibilities. I interviewed Robert from a concrete conference room at the Tercer Piso co-working space in downtown Guanajuato Mexico so any echo chamber noise is my fault. And with that, a shout-out and thank you to my editing crew at Castle Media Group in Austin. Video with 10 year old Kiera Landers. Rex De Gusman – ReXDeLRaY on Youtube.